Only have 20mins to prepare a meal? Then this one is perfect and super yummy! I treated myself to a tuna steak this evening and it was definitely worth every penny. I had it as a light meal but if you want something more substantial I’d eat it with new potatoes. This feeds one so just multiply everything by the number of people you are cooking for. Heat your oven to 180C. In a bowl mix a spoon of vinegar for two spoons of oil. Place the cherry tomatoes in an oven proof dish and cover with the ‘vinaigrette’ add salt and pepper to taste. Once the oven is hot put the tomatoes in; they should take no more than 15mins. You should start this about 5mins before the tomatoes are done. Heat a pan, add oil (not much about 2 tablespoons worth), chilli flakes to taste, salt and pepper and add the tuna. Cook for 2mins on each side. 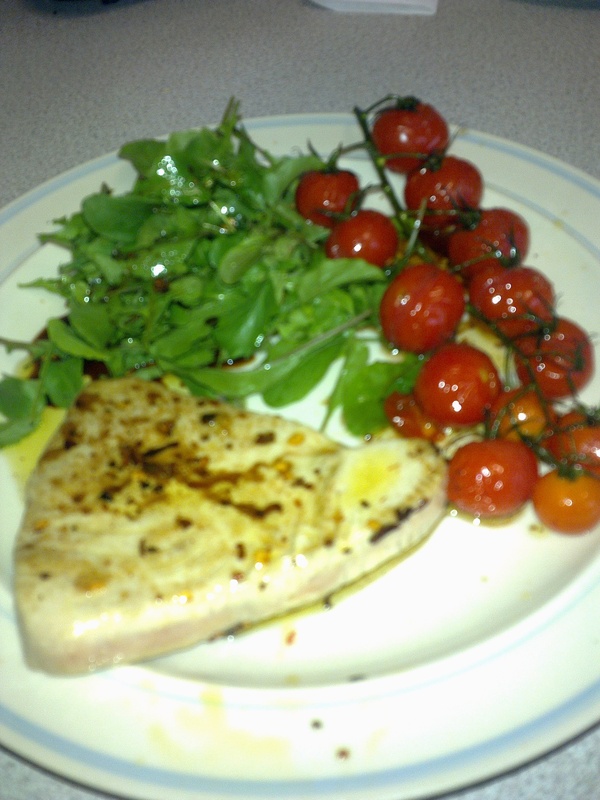 Place the tuna, the cherry tomatoes and rocket on a plate. Add about a tablespoon of vinegar to the hot pan, mix, and pour over the tuna, rocket and tomatoes. If you want more ‘vinaigrette’ you can also use some from the tomatoes.